One of my favourite places in the world is Wales - we have family there and spent a lot of our holidays there as children. 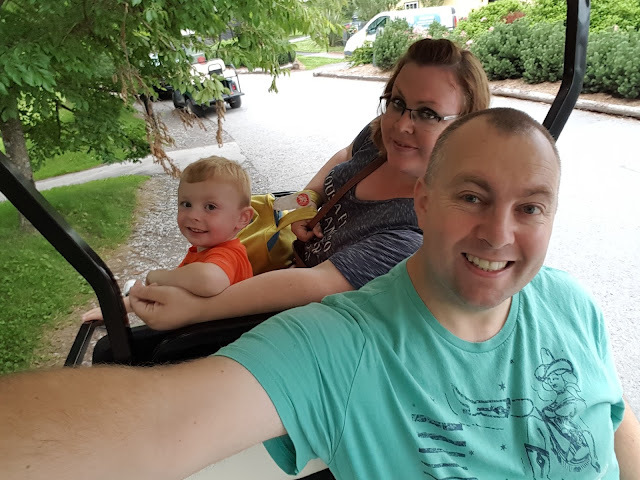 There is so much to do, plus the scenery is beautiful and you can't beat the beaches! Bluestone is a 4 hour journey from Dorset so we set off nice and early on the Friday and couldn't wait to start our mini break. We stopped for breakfast at White Row Farm in Frome which is a brilliant farm shop and cafe, the food is lovely there. Unfortunately Elliot was in a bit of a grump and said he wanted to go home and wouldn't eat anything! 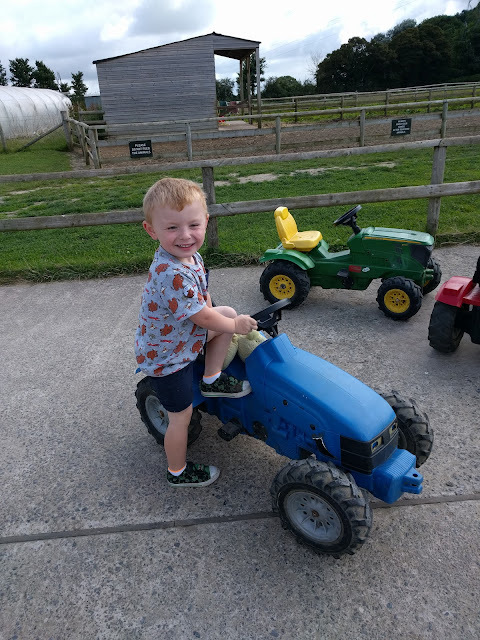 After a stop in the farm shop (and buying yummy things we didn't really need), and a quick play in the playground we were on our way. Looks can be deceiving, he was grizzling 5 minutes before this! Sadly, my fears of Elliot not feeling well were confirmed when he decided to be sick on the M4 - ahhhhhh!!! Luckily I managed to catch most of it in a carrier bag but we had to pull over on the hard shoulder to do a quick clean up....yuck yuck yuck! On our way again and we stopped at a supermarket in Camarthen to get a few supplies for the weekend. There is a little village store at Bluestone which stocks the basics but we decided to stop anyway, it was a good excuse to stretch our legs! We arrived at Bluestone around 3pm and joined the queue of cars at the check in gates. Within a few minutes we had our keycard for our holiday home and a map of the resort, it was so quick and straightforward. We weren't able to check into our lodge until 4pm so we parked the car in the long stay car park and my husband went off to sort out a golf buggy for us. Golf buggy hire was £80 for the weekend which isn't cheap but if you have little ones or don't fancy the hills then it's a great idea to hire one. It's also great fun whizzing around! As we had some time before check in we headed straight to the Blue Lagoon pool - this was a highlight from our last visit so we couldn't wait to go for a swim! Elliot was back to his perky self now too and he couldn't wait to get in the pool. It was a really good time to go because the pool was really quiet and there were plenty of family changing rooms available. And the water was SO warm, just like getting into a lovely bath! There is plenty to do at the pool for little ones - there are two toddler areas with mini slides, inflatable balls and a pirate's shipwreck to explore. 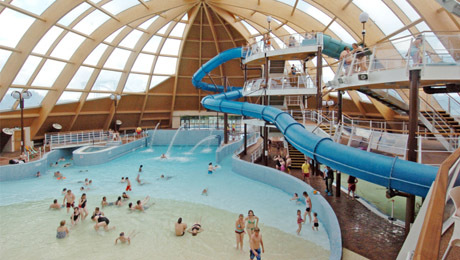 If flumes are your thing then there are several slides plus a really nice lazy river in which you can just bob round. It takes you outside and it was certainly a lot warmer than when we went in Winter last year! My personal favourite bit is the wave machine, and even Elliot loved this. He liked to dive through the waves! Soon it was time to drag ourselves away from the pool (it was tough, could have stayed all day!) but we were excited to check out our lodge. 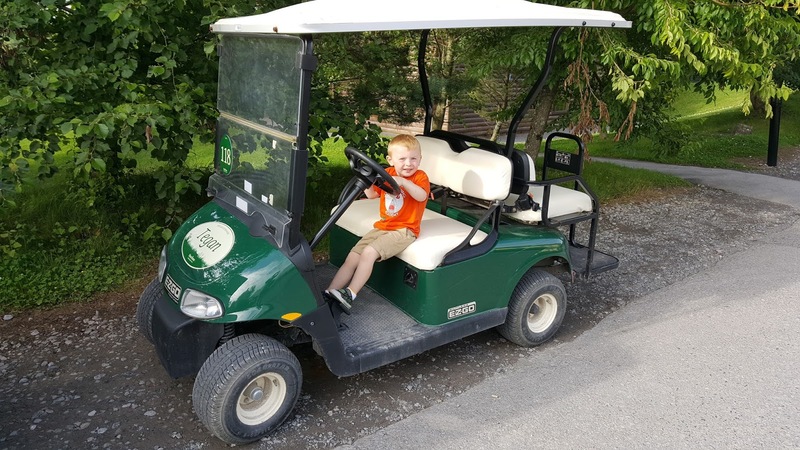 Cars aren't allowed on site through the weekend but you are allowed to drop your luggage off on check in day so we nipped back to the carpark and swapped the golf buggy for the car. 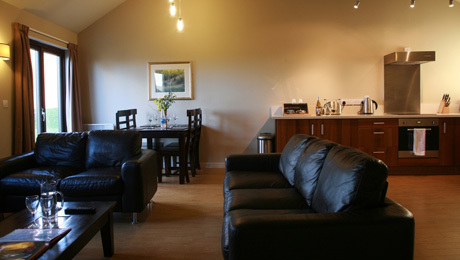 We were staying in one of the Caldey Lodges on Barthomelew View which was a short walk from the lake and village area. 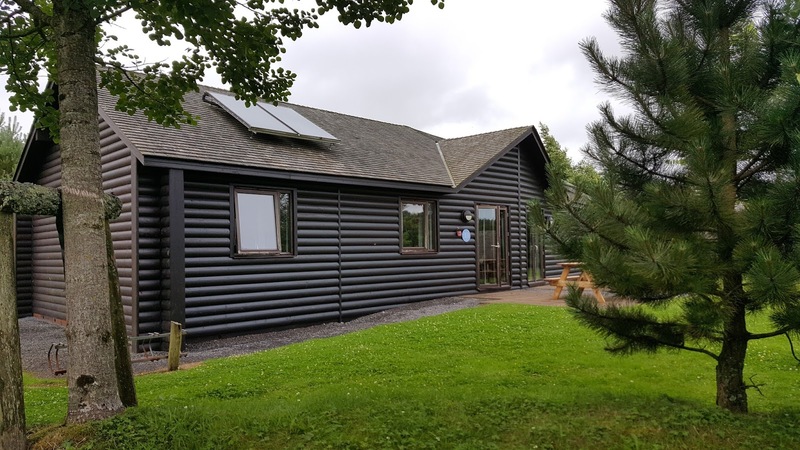 With two large bedrooms and lovely open plan kitchen/lounge it was everything we would need for the weekend. As with our previous visit, everything was spotless and the beds looked so comfy and inviting! Not of my photos, mine were filled with the mess that a 3 year leaves so thought you might appreciate one of the official pics from the Bluestone website!! We quickly unpacked and headed down to the village to seek out some dinner, it had been a long day and we were all pretty tired and hungry. Especially after the swimming! 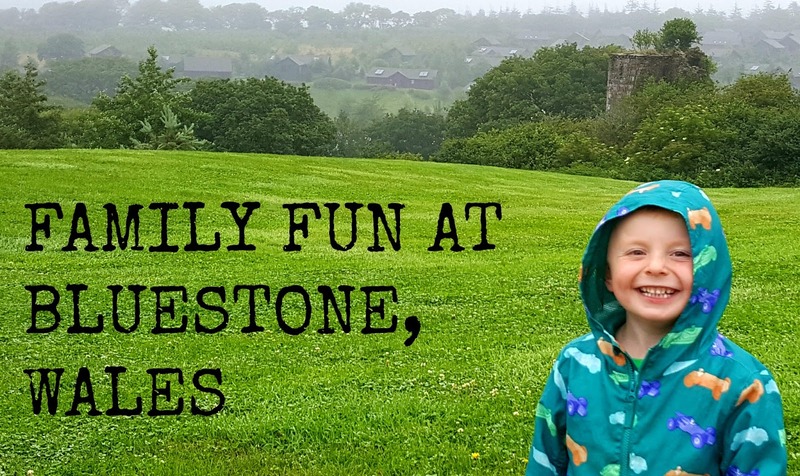 We booked a table in the Farmhouse Grill for 7pm and headed over the Knights Tafarn, Bluestone's family friendly pub for a drink. 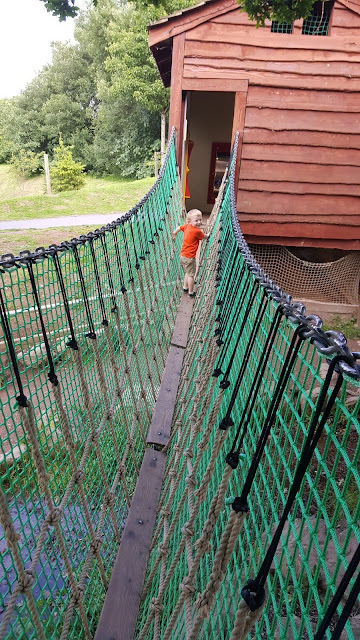 The lure of the outside play area was too much for Elliot so he ran off for a quick play whilst we enjoyed our drinks in the evening sunshine. The food at the Farmhouse Grill was really good - it has changed slightly since our last visit and they no longer have the kids buffet but I was really impressed with the kids menu. 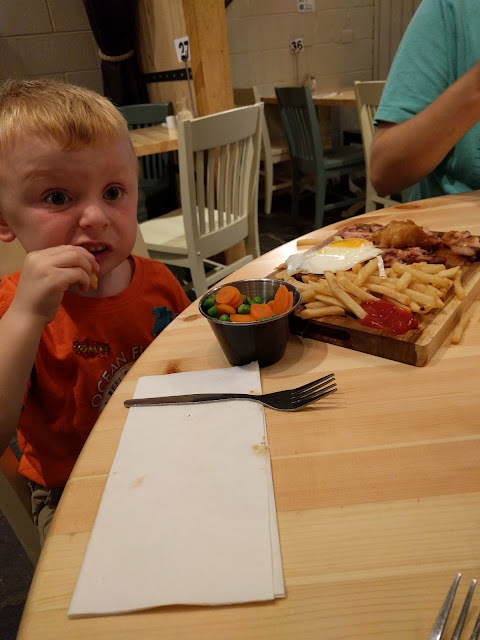 Elliot had gammon steak with chips, egg and veg and the not only was the portion huge but it was really really tasty!! 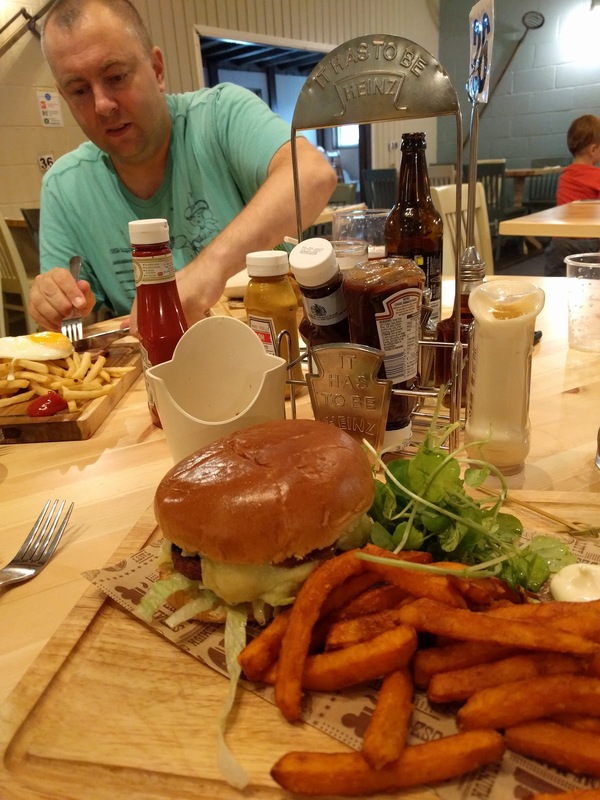 My husband and I both had a burger...no complaints from us! We couldn't squeeze in any pudding so we headed on back to our lodge and I for one couldn't wait to go to sleep! *Disclaimer - We were given a 3 night break for the purpose of this honest review but all views are my own. We LOVED it!